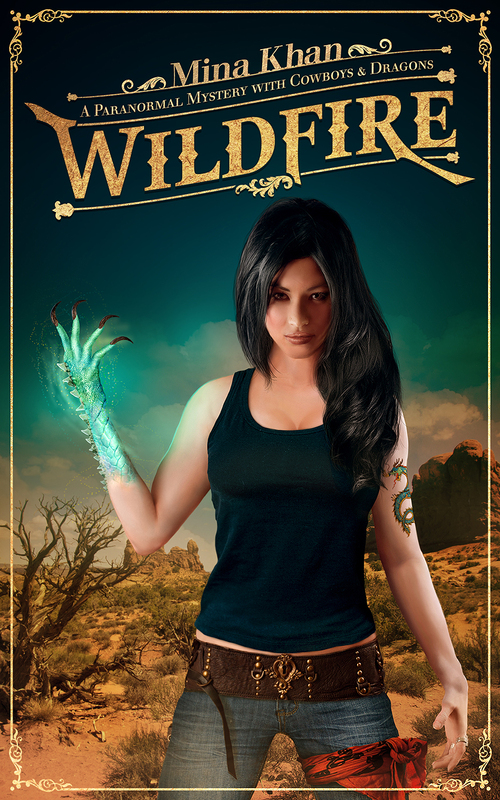 I also found out Wildfire, the book of my heart, is a finalist in both the 2014 Daphne du Maurier Award of Excellence and the 2014 Prism Contest. Wow, yes, this news made me cry and laugh. It has kept me happy dancing throughout the month. What a wonderful nod from my peers. And, wow, there are others who love my story as much as I do...SQUEE! And then there was RT in New Orleans. About 3000 people attended the conference and then add in all other people who were at the hotel for different reasons...yup, you can imagine the crowd. It let me frazzled, dazed and confused for the most part. 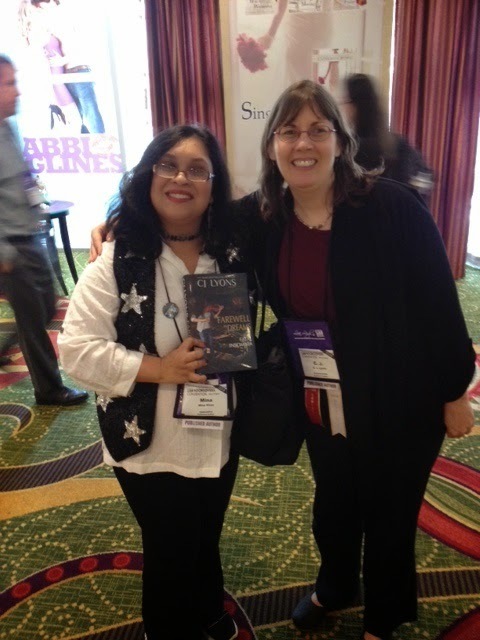 However, I did manage to meet up some awesome authors I have loved and admired and that was so much coolness! And I totally gushed and fan-girled over Marjorie M. Liu and Megan Hart, fortunately they handled me with grace and amusement. I also had a very nice breakfast with Rachel Caine, visited an oyster bar with Cathy Clamp, and hunted down oatmeal with L.J. Charles. I went on a ghost tour with Cynthia Eden, Katie Reus, Kaylea Cross and friends...yup, made lots of wonderful memories! Then I returned home to tornado warnings, hail and, blessed, rain. After living with drought conditions for a long, long while, watching it dry out our lakes and turn much of West Texas brown, I'll take the hail and be thankful for the rain that filled our lakes and nourished our gardens. While I'm grateful for all the wonderfulness of May, it's good to be back home and in my own space. Happy reading y'all! This May Brenda Novak's Online Auction for Diabetes Research celebrates its 10th anniversary. This is an amazing month-long fundraising event where you can bid on the fantastic and the useful. Want to meet Celine Dion after a concert or lunch with a favorite author? Want an established author, editor or agent to give you feedback on your current manuscript? Or, how about a vacation in Hawaii? Maybe all you want is books, books and more books...you can bid on all this and more at the auction between now and May 31. In the past I have supported the auction by bidding on items. I have won awesome critiques from author Jim C. Hines and Agent Kristin Nelson, which provided valuable writing insights. I have won signed books from favorite authors for my Keeper Shelf. I'm going to the Romantic Times conference in New Orleans this month thanks to a bid I won last year. This year, I'm even more excited because I'm in a place where I can do more to support the cause. Several author friends and I joined together as the MMM authors to work together and to collaborate on projects. We had fun pooling together our resources and abilities to come up with items for Brenda's auction. Check out our Mmm-licious Goodies from the MMM Authors listing. Yes, my offerings includes a Western themed kitchen set...aren't the cowboys & boots cute? 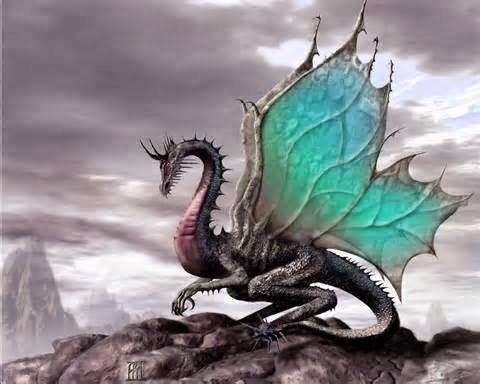 And I have a personal offering too -- a signed copy of Wildfire with a Dragon bookmark. Diabetes is a disease that touches everyone's life in one way or another. Brenda embraced the cause when her 5-year-old son was diagnosed with diabetes. My grandfather had diabetes. We all have family and friends, people we know and love, who are dealing with diabetes. So come on out and support Brenda's Auction, help raise funds for diabetes research, find some cool deals and have fun! Oh this year, Brenda has a bookish special in addition to the auction. 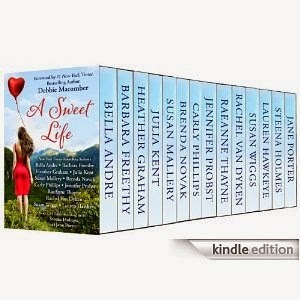 She's brought together 14 award-winning, bestselling, story telling authors in a boxed set called A Sweet Life. All the proceeds go to diabetes research.